Buffy the Vampire Slayer Sky TV 7-Card Promo Set Coming to the U.S. In April 2004, Inkworks created a limited, seven-card, Buffy the Vampire Slayer promotional card set for the UK cable TV network, Sky. 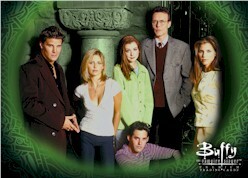 The set consists of seven new cards featuring each season's Buffy cast photo. Only 380 of these sets were sent to media outlets in the UK to promote Sky's Buffy the Vampire Slayer Marathon Weekend. "We had so many Buffy fans contact us about how to get this set of cards that we thought that we needed to do something to reward that support of Buffy," said Allan Caplan, president of Inkworks. "Buffy fans are a special group. They are incredibly loyal and have always been enthusiastic about our products." In response to hundreds of fan emails and requests for the Sky TV promo card set, Inkworks went back to the printer to put together sets from the print overrun to help satisfy collector demand. These sets are part of the original print run and are not re-prints or copies. They will be available through Inkworks retailers beginning on June 9th for a suggested retail price of $29.95 per set of seven cards. Sets have been allocated to Inkworks dealers, so contact your favorite trading card retailer and place a pre-order as soon as possible to ensure that you don't miss this opportunity to own the Buffy the Vampire Slayer Sky Promotional card set. If you have any problems locating an Inkworks dealer who carries these cards, please contact us at info@inkworkscards.com and we will do our best to help.